In Brazil and Chile, the government-backed plans to build two dams in order to increase their domestic energy supplies, have led to demonstrations by indigenous people to defend their access to their traditional lands. In Bolivia, a highway construction project has resulted in demonstrations by indigenous villagers living along the route of the proposed highway. Protests and demonstrations in these countries have been challenged in court where judges, in several key rulings, have suspended or halted construction projects. The Belo Monte Dam, a proposed hydroelectric project on the Xingu River in Pará, Brazil, has been in the planning stage for thirty years. The first version of the dam dates back to 1975 when it was formerly known as Kararaô. The Kararaô project proposed six dams that, if built, would have flooded 20,000 square kilometers (km2) of rainforest, including protected areas and indigenous land. In 1989, indigenous tribes in the region, supported by international environmental organizations, mobilized the first large demonstration against the project in the city of Altamira. The event attracted significant international media attention, drawing in celebrities like Sting and Anita Roddick (founder of Body Shop). As a result of the protests, the World Bank withdrew its loan for the construction of the dam. Due to Eletronorte’s depleted funds (under whose auspices the dam would have been engineered) after the previous construction of the dams in Tucuruí and Balbina, coupled with its marred financial status as a result of Brazil’s debt crisis, the government was unable to finance the project. After thirty-six years, the project now has been exhumed, but with a new name: Belo Monte. In contrast to the Kararaô project, the new plan features only two dams: one on the main river channel forming the reservoir, whose waters will be diverted through two artificial channels to a second dam where the generation plant will be situated. Despite the scaling down of the proposed Belo Monte project, the creation of the new dam will still result in major negative environmental effects. The dam will flood over 500 km2 of land, including part of Altamira, and will dry out more than 100 km of the Xingu River. The dam will cause the displacement of 20,000 to 50,000 people and will also negatively affect the livelihood of the people of riverside communities, who will most likely lose their source of livelihood as a result of drainage issues. Moreover, the dam will flood a pristine environment at the heart of the Amazon, potentially resulting in the loss of a number of unique species of birds, fishes, and reptiles. 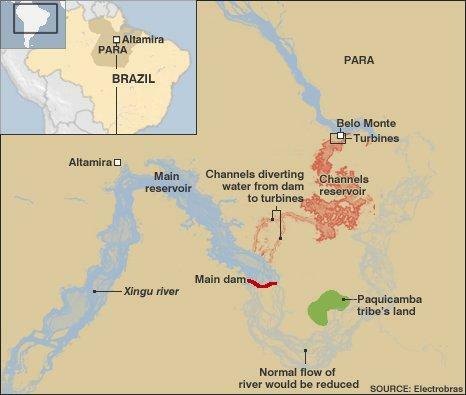 Generating 11,200 megawatts (MW), the Belo Monte Dam would be the third-largest dam in the world after the Three Gorges Dam in China and the Itaipu Dam in Paraguay. The Belo Monte Dam is expected to cost USD 17 billion, including USD 2.5 billion for the transmission lines. The consortium involved in the construction is Norte Energia, of which the Brazilian government will be a major shareholder through the state company Eletrobras. In addition, through loans and credits, the Brazilian Development Bank (BNDES) will finance eighty percent of the cost. The government consistently has been in favor of the project because it will be a step toward Brazil’s long-desired goal of energy independence. Brazil currently produces eighty percent of its electricity from hydropower, and the construction of new hydroelectric power plants has been the focus of former President Luiz Inácio Lula da Silva’s Programa de Aceleração do Crescimento (PAC). Along with Lula’s PAC initiative, a ten-year energy plan was implemented in 2007 to oversee the construction of seventy-one new hydroelectric power plants. The newly constructed plants will have an installed capacity of 29,000-MW, mostly located in the Amazon region. The government argues that the energy generated by the Belo Monte power plant is needed to support the country’s growing energy demands by providing affordable energy to Brazilian households. However, only seventy percent of Belo Monte’s energy will be sold for public consumption while the remaining thirty percent will be utilized by energy-intensive industrial mining. A 2007 study conducted by the World Wildlife Fund (WWF) stated that by investing in energy efficiency, Brazil could cut forty percent of its expected demand for electricity by 2020. The power saved would be equivalent to fourteen Belo Monte hydroelectric power plants. The WWF study suggests that by retrofitting existing hydroelectric power plants, thousands of MW would be added to the energy grid without the need to create a new dam. In June 2011, the Instituto Brasileiro do Meio Ambiente e dos Recursos Naturais Renováveis (IBAMA), the enforcement body under the Brazilian environmental agency, released the license for the construction of the Belo Monte Dam. In September 2011, Judge Carlos Castro Martins ruled in favor of a fisheries group, which argued that the Belo Monte Dam would affect local fish stocks and could harm indigenous families who make a living from fishing. The judge said that the construction of the Belo Monte Dam would interfere with the natural course of the Xingu River and therefore should be halted. Since then, the war against Belo Monte has not ended, with Norte Energia expected to appeal the decision. HidroAysén is a USD 3.5 billion project that aims to build five dams on the Baker and Pascua Rivers in Aysén, a pristine environment in the Patagonia region in southern Chile which is known for its glaciers and lakes. HidroAysén is a joint venture between Endesa (a Spanish company owned by the Italian state company Enel) and the Chilean company Colbún. The project consists of the construction of two dams on the Baker River and three on the Pascua River, which in total are expected to generate 2,750-MW (about thirty-five percent of Chile’s total energy consumption). The energy would travel from Aysén to the north of the country where the major cities are located. To carry out this transmission of power, the joint venture also plans to build 2,300 km of high-voltage power lines. These lines will affect thousands of public and private properties in nine regions of Chile. The cost of them alone will be about USD 4 billion. In addition, Endesa owns the vast majority of water rights in Chile; eighty-five percent of the country’s bodies of water (rivers and lakes) are privately owned, with eighty percent of that owned by the Spanish company. In 1981, then dictator Augusto Pinochet approved the Water Code bill (Código de Aguas). The law firmly established that the nation’s water is not public property but a private commodity. According to the Pinochet-era measures, water has commercial value, like a house; individuals can lease, use, or sell it. As a result, Chilean rivers, lakes, and subterranean waters are now primarily in the hands of private companies. Like the Brazilian government, the current Sebastián Piñera administration supports the project because it believes the country needs more energy at the lowest possible prices to support its economic growth. In fact, because of its energy-intensive mining industry and improving standards of living, some analysts suggest that Chile will need to triple its energy capacity in fifteen years. Chile has little oil or natural gas and imports ninety-seven percent of its fossil fuels, and, like Brazil, it depends largely on hydropower electricity. Furthermore, in light of the 2011 earthquake in Japan, the nuclear energy option has fallen out of favor. The energy system in Chile is extremely fragile and, according to the government, the HidroAysén Dam would be a much safer energy source for the country. As is being witnessed in Brazil, opponents of the dam say that the project would destroy a pristine environment because the dam would flood fourteen thousand acres, eliminating whitewater rapids and waterfalls that attract a growing amount of ecotourism. In its place, critics of the dam want the government to focus on improving energy efficiency and developing renewable sources. At the present time, Chile gets less than five percent of its electricity from renewable sources, but the country has an abundant renewable-energy potential this includes the sun in its northern deserts, wind along the pacific coast, geothermal sites, and biomass from its agricultural areas. Local opponents to the dam project are supported by international personalities like Robert F. Kennedy Jr., senior attorney for the U.S. Natural Resources Defense Council, who appealed to President Piñera to call off the project. 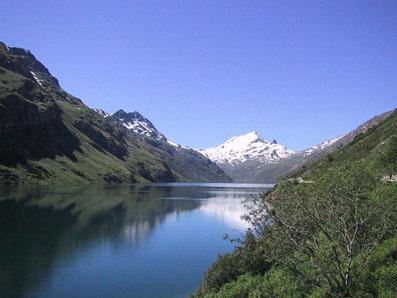 The environmental associations are expected to continue their fight against the HidroAysén project, but Italy, which holds thirty-two percent of the Enel stock, is arguably the only party that can stop the project. There are no laws that allow the Chilean government to halt the project because, according to the Código de Aguas, once the water rights are given to an individual or a private company, the state cannot intervene. The owners of the water rights are only obliged to declare where, when, and for what purpose they will use the water. The current role of the government is simply to monitor the use of water and ensure that private companies comply with their proposed plans. Chile’s choice to privatize its entire water sector has not necessarily meant an improvement of service for the population. On the contrary, the price of water has increased while the percentage of the population efficiently provided with drinking water and sewage services is almost exactly the same as before privatization. The third case concerns the construction of a highway in Bolivia. Although different from the other two, the macro-project has caused a similar reaction from the public. On October 20, 2011 more than 1,500 indigenous Bolivian protesters arrived in La Paz after a sixty-six day march covering 603 km to demand that President Evo Morales renegotiate the construction of a 305 km road. The projected highway would cross the country linking the Andean highlands of central Bolivia with the Amazon lowlands to the north. The construction was designed to be split into three segments; the first and the third are already underway, but the controversial second segment has led to protests by the indigenous. This part will cross the Isiboro Sécure National Park and Indigenous Territory (TIPNIS), where there are over 700 species of fauna and 400 species of flora, as well as the distinct forests in the park, which play a crucial role in regulating water cycles and climate. A study estimates that sixty-four percent of the national park would be lost within eighteen years if the road is built12. The Brazilian company OAS Construtora is in charge of the construction of the road, which is expected to cost USD 415 million, eighty percent of which is to be financed by BNDES and the remaining twenty percent by the Bolivian government. Members of the indigenous movement have insisted that they are not against the plan to build a highway linking the regions of Cochabamba and Beni. Rather, they are protesting the fact that the Bolivian government did not respect their rights by not consulting them about the proposed highway that would go right through the middle of their territory. In fact, according to Convention 169 created by the International Labor Organization (ILO) and ratified by Bolivia in 1989, indigenous communities have the right to demand consultation for any project affecting their land. The right of the indigenous people to prior consultation is also stated in the 2009 Bolivian constitution. The opponents of the highway also fear the “colonization” of the area by the cocaleros (coca farmers), who make up a significant proportion of Morales’ support base, The planned road has sharply divided opinions in Bolivia; while the indigenous have opposed the project, there have been demonstrations of support from coca growers and some trade unions defending the project because they believe it will boost development. The government says the highway will lead to development when it comes to the indigenous communities living in the TIPNIS, the regions of Beni and Cochabamba, as well as for the country as a whole. It maintains that agricultural producers in Beni and Cochabamba will have greater access to markets for their goods and that the highway will increase the availability of electricity and other public facilities, thus advancing the integration of Bolivia. In the end, after months of protests and clashes with police, the indigenous communities finally won their battle when on October 25, 2011, President Morales signed a new law banning the construction of the highway through the TIPNIS territory. After this decision, Brazil’s ambassador to Bolivia, Marcel Biato, said that the Brazilian government is now waiting for an alternative route to link the two other parts of the highway. Although Brazil, Bolivia, and Chile are facing different problems, the three projects have the same goal: to support their respective economic growth. Unfortunately, these governments’ attempts to fulfill economic needs are clashing with the lifestyle of indigenous peoples. As those who are most affected by these projects, the native peoples strongly oppose them, defending their right to live on their land and protect it from destruction. For their part, their respective governments try in every way to defend the value of their local projects, considering them a driver of economic development until, as in the case of Bolivia, they are forced to yield to public pressures. For such societies, a problem arises: weighing economic development against environmental protection. Clearly, this struggle is not a question of political affiliation, as evidenced by the fact that Piñera is a billionaire who heads a right-leaning coalition while Morales, a professed man of the left, is an indigenous leader of the cocaleros, who in 2009 approved a new constitution that focuses on Pachamama (Mother Earth),. This tension between economic growth and protecting indigenous rights calls into question the viability of an ideology based on the industrialization of natural resources. Can it be imagined any another way? The exhaustion of natural resources and the now palpable effects of climate change suggest that an alternative is needed. As demonstrated by protests all over the world, giving a voice to local communities regarding development is almost certainly the right place to start. Para leer este análisis en español, haga click aquí.